Rowland Air is an Air Conditioning and Heating Installation Company located in Canyon Country, providing excellent service for anyone living in the Santa Clarita Valley. Rowland Air has been in the business of heating and air conditioning installation, service, and repair for more than 20 years. With their continuous service since 1987, customers can trust and depend on Rowland Air to provide the expertise needed for a professional installation. The employees at Rowland Air put customer service above all else, making it their goal to provide customers with the most dependable, economical, and professional heating and air conditioning systems available. 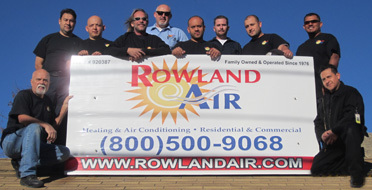 Rowland Air does much more than just installation in Santa Clarita homes and businesses. Rowland Air also offers repairs for both heating and air conditioning systems, duct sealing, duct replacement and repair, and will even give your home or business a home energy audit or assessment. Your ducts are very important with keeping your house the right temperature. In houses with forced-air heating and cooling systems, ducts are used to distribute conditioned air throughout the house. In a typical house, however, about 20 percent of the air that moves through the duct system is lost due to leaks, holes, and poorly connected ducts. The result is then higher utility bills and difficulty keeping the house comfortable, no matter how the thermostat is set. The duct system that runs throughout your home and delivers all the air from the furnace and condensing unit may be what keeps you warm in the winter and cool in the blazing heat of summer, but if your duct system is damaged, broken, or torn then you are wasting energy, which causes your utility bills to increase. Damaged ductwork allows air to escape inside walls or even cooling down your attic instead of delivering the air where it is intended inside your home. There are several ways that can cause damage to your ducting: age and corrosion, rodents and animals, and home repairs or maintenance. Rowland Air then provides their staff with the technology to show homeowners the crushed areas, broken joints, or missing attachments that result in air loss within their home. Dedicated to providing excellent service to the residents of Santa Clarita, Rowland Air continues to happily serve citizens and help them feel even more comfortable in their homes.